Ectopic pregnancy is one of the most common nonsurgical abdominal conditions during pregnancy. Unfortunately, most of these presentations are during early pregnancy when the conceptus is not developed for the independent life and is also not “viable.” Preoperative and early diagnosis is common due to the specific clinical presentation and the routine use of βHCG for women of reproductive age presenting with pain in the lower abdomen. Depending on the fetal status and severity of bleeding, both conservative and operative interventions are available and successful. Biggest diagnostic and therapeutic dilemmas arise in patients with heterotopic or advanced abdominal pregnancy. The clinician should always look for intrauterine pregnancy preoperatively even when ectopic pregnancy is confirmed. 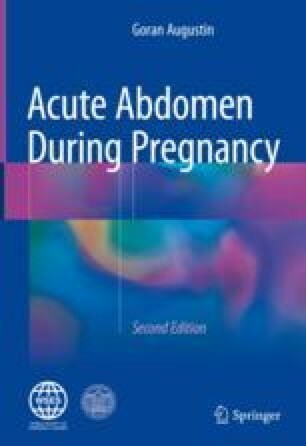 Advanced abdominal pregnancy poses a real intraoperative problem due to adherence of the placenta to surrounding organs and tissues, and insisting on its complete removal can cause significant and sometimes unstoppable bleeding.